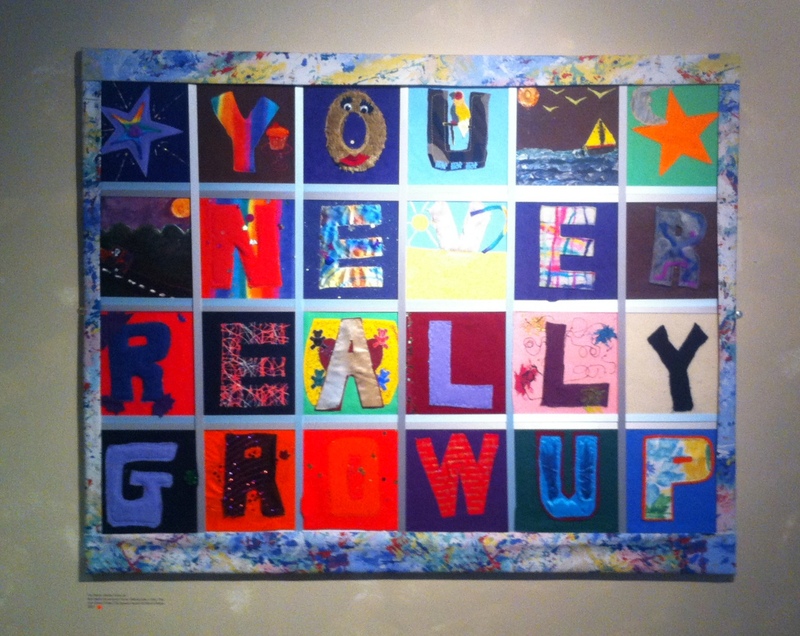 'You Never Really Grow Up', Red Bank Community Home, John Drew Under 18s Special Award for Mixed Media, in 'Strength and Vulnerability Bunker' at Southbank Centre, Bankside, London. Photo credit Kelise Franclemont. A new exhibition at Southbank Centre, London and co-sponsored by Koestler Trust displays the artwork produced by prisoners, offenders, secure psychiatric patients and immigration detainees, all seeking rehabilitation through art. Curated by rap artist Speech Debelle, the show runs from 25 September through 1 December 2013. Entry to ‘Strength & Vulnerability Bunker’ at Southbank Centre, Bankside, London. Photo credit Kelise Franclemont. 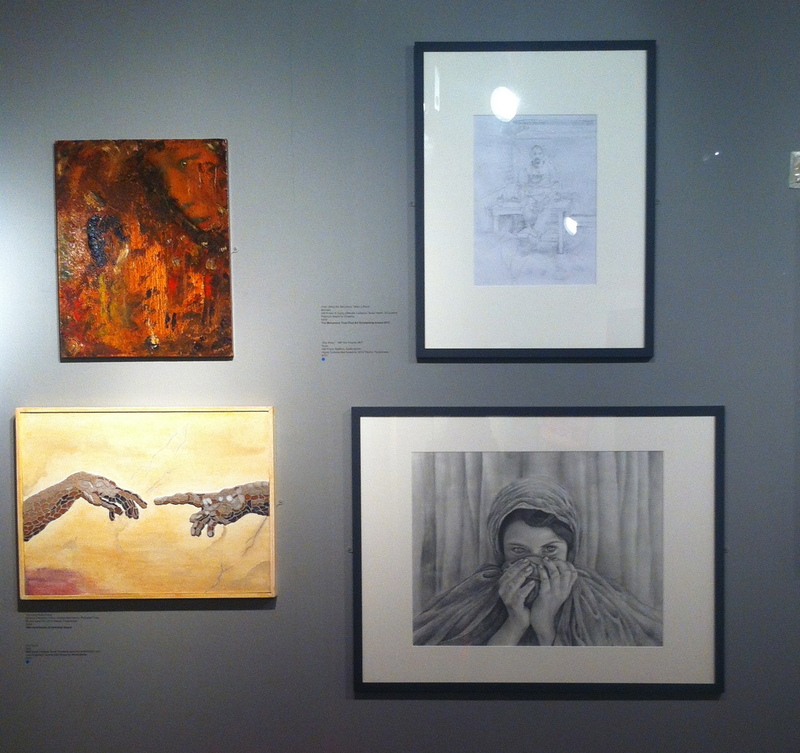 ‘THE STRENGTH & VULNERABILITY BUNKER‘ is the 6th exhibition in partnership between Koestler Trust (a UK-based prison arts charity) and Southbank Centre to showcase artworks by offenders, secure patients and detainees. Jeremy Deller, Koestler Awards judge, Turner Prize-winner and Britain’s representative at this year’s Venice Biennale, opened the exhibition on 24 September 2013. Installation view of ‘Strength and Vulnerability Bunker’ at Southbank Centre, Bankside, London. Photo credit Kelise Franclemont. From its inception 50 years ago, Koestler Trust offers prisoners a creative outlet through art along with the opportunity to learn skills or a trade. Equally, the annual Koestler Awards are a chance to be formally recognised for achievement. 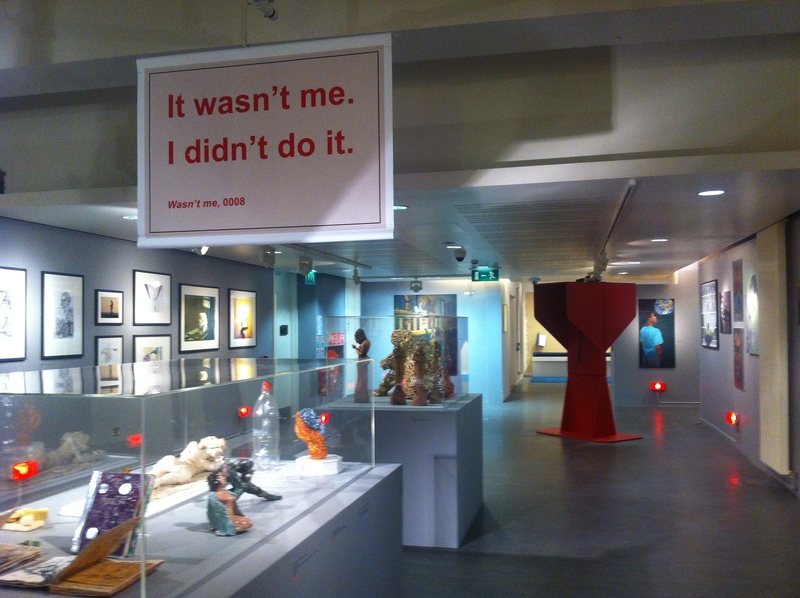 Many of the artists will receive written feedback on their work from a judge and the Koestler arts team; some will even receive comments forwarded to them (anonymously) from the visitors to the exhibition, who choose an award for their favourite artworks by submitting a ballot card from the stacks dotted around the venue. Installation view of ‘Strength & Vulnerability Bunker’ at Southbank Centre, Bankside, London. Photo credit Kelise Franclemont. Past curators of this Southbank Centre event include British artist Sarah Lucas, women prisoners, and crime victims. Award-winning rapper Speech Debelle curated this year’s exhibition to explore the duality of strength and vulnerability, which plays a big part in her own music and writing. Thus Debelle organised the space into three main themes around forgiveness, healing, and reflection/regrowth. ‘Son of a Red Man’, HM Prison & Young Offender Institution Parc, Hope Highly Commended Award for Ceramics, in ‘Strength and Vulnerability Bunker’ at Southbank Centre, Bankside, London. Photo credit Kelise Franclemont. Installation view in ‘Strength & Vulnerability Bunker’ at Southbank Centre, Bankside, London. Photo credit Kelise Franclemont. The artist who made ‘Son of a Red Man‘ writes about his or her work, “I actually like myself when I’m covered in clay, making things, helping classmates, constantly amazed at how my pieces turn out and how quickly I’m progressing. It’s a lovely side of me I’ve found. ‘First Hour’ by Dean, HM Prison Littleby Cambridgeshire, Gold Award for Recycling or Paper Mache, ‘Strength & Vulnerability Bunker’ at Southbank Centre, Bankside, London. Photo credit Kelise Franclemont. 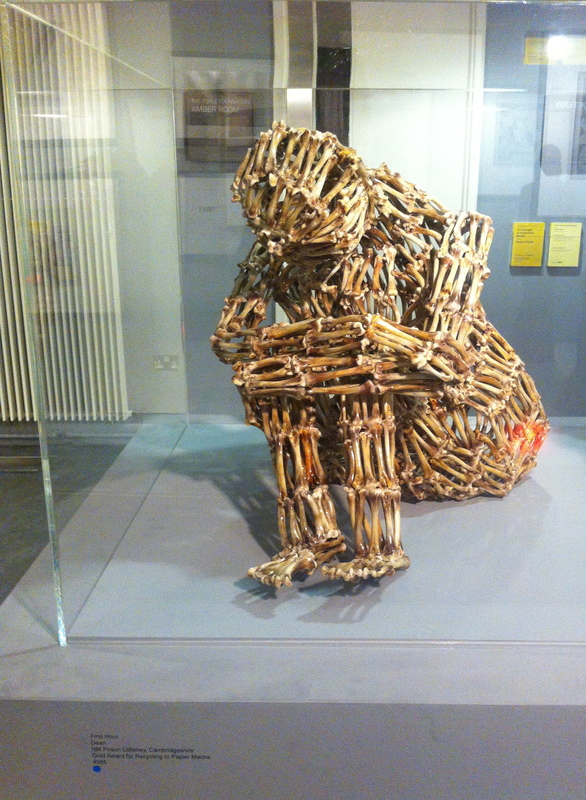 “I smiled when I saw the theme chosen by Speech Debelle [Strength and Vulnerability], because that is what ‘First Hour‘ is meant to represent”, writes Dean, of his sculpture made of chicken bones sourced from the prison kitchen. ‘Walk in My Shoes’ by Daycare group of 10, HM Prison Pentonville, London, craft, in ‘The Strength and Vulnerability Bunker’ at Southbank Centre, Bankside, London. Photo credit Kelise Franclemont. The card reads, ‘Before you criticize someone, walk a mile in their shoes’. ‘Walk in My Shoes’ (detail) by Daycare group of 10, HM Prison Pentonville, London, craft, in ‘The Strength & Vulnerability Bunker’ at Southbank Centre, Bankside, London. Photo credit Kelise Franclemont. Founded in 1962 by newspaper proprietor David Astor and the author of Darkness at Noon, Arthur Koestler, the primary aim for Koestler Trust is to empower offenders and ex-prisoners to transform their own lives. These would-be artists build self-esteem and often, a new career, through one or more of 56 forms of art, craft, or other creative expression such as poetry, music and theatre. ‘Then I’ll huff and I’ll puff’ by Dena, HM Prison Send, Surrey (women), David Wentworth Platinum Award for Textile Art, ‘Strength & Vulnerability Bunker’ at Southbank Centre, Bankside, London. Photo credit Kelise Franclemont. Painter and former drugs smuggler Peter Cameron cites his success as an artist is due to the intervention and mentoring by Koestler Trust. While in prison, Cameron discovered a previously unknown talent and passion for painting. Becoming an artist at age 40, he soon gained many clients among his fellow prisoners by copying family photos in exchange for tobacco. Cameron won three Koestler Awards for his work during his incarceration and is currently an independent free-lance artist, living and working in Liverpool. 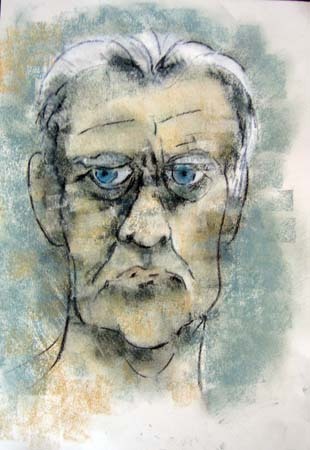 He won the The Alex Prowse Website Award for Pastels in 2007, and alongside his art practice, he continues to serve Koestler Trust as a session mentor and award judge for the Koestler Awards. Art is more than a vehicle for personal growth; for the first time this year, the Koestler Trust recruited 11 ex-offenders as exhibition hosts for ‘The Strength & Vulnerability Bunker‘ showcase. Besides invigilating, the hosts conduct free tours of the show, and are readily available to answer questions about their experience with Koestler Trust, arts programmes in prisons, and their participation in Koestler Award exhibition. 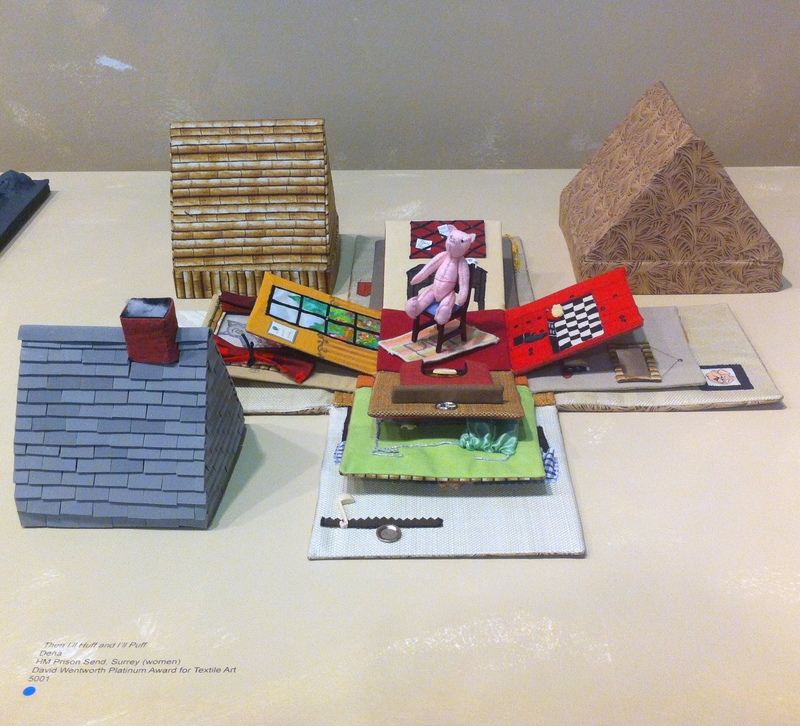 Installation view, ‘Strength and Vulnerability Bunker’ at Southbank Centre, London. During my visit, I was able to chat with two of the exhibition hosts, Jackee and Nigel, who kindly shared their views on the showcase. Though not artists themselves, both were keen and articulate guides and each pointed me to a favourite artwork that carried a particular resonance. The painting that spoke the most to Jackee is entitled, ‘Forgive me‘, a touching image of a man in darkness bent in prayer, illuminated by a bright beam of yellow light streaming in through a single window at his back. For Jackee, this is work belies great faith and hope, pondering that even in the dark place of having committed a grave mistake, there is always a second chance at life. Nigel and I discussed another painting at length by an artist he says is “the oldest person in the exhibition”. Aged 70, the artist identified only as an inmate from a women’s facility, created a picture of three people, paper doll-like, draped from a clothesline. Titled, ‘Hung out to dry‘, the work seems to be an expression of defeat but only nearly, for behind the hanging figures, there is still something optimistic in the cloudless blue sky. 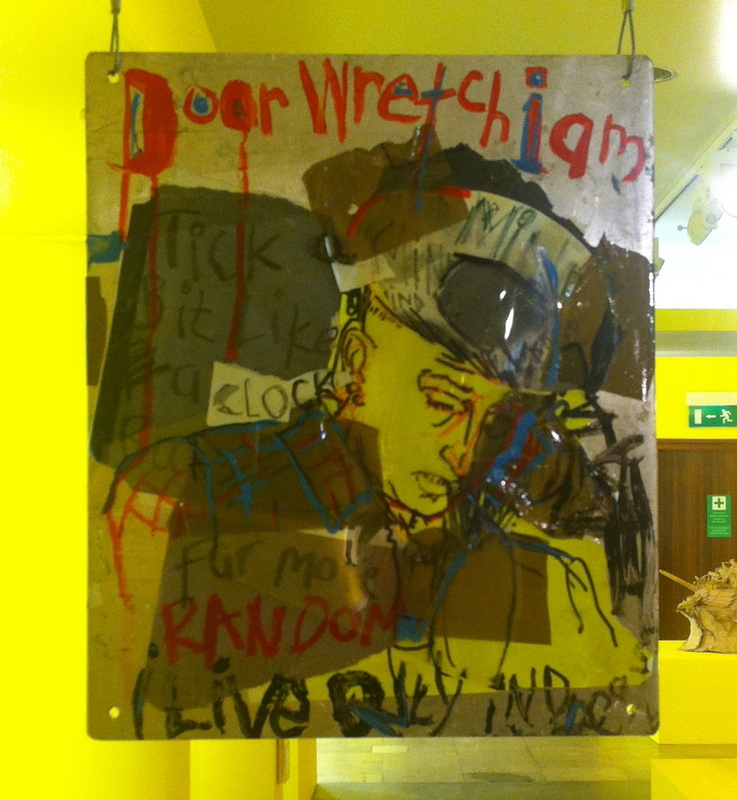 There is growing evidence that the arts are an effective in changing offenders’ lives… The artwork we exhibit demonstrates powerfully what offenders can achieve with the right support and educational input. Exhibition details: ‘Strength and Vulnerability Bunker’ shows at Southbank Centre in Spirit Level Foyer Space, Belvedere Rd, London SE1 8XX from 25 September through 1 December 2013. Free admission.